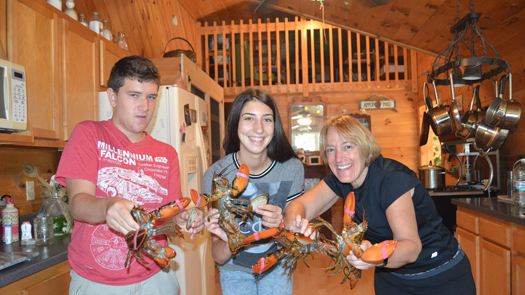 Minja (center) with host family and lobsters for dinner! Minja, an American Councils-placed American-Serbia and Montenegro Youth Leadership Exchange (A-SMYLE) student from Serbia, is energetic and has a positive and outgoing personality. Minja is proud of how active she has become in her host high school. She takes AP Spanish, maintains a straight-A average and is a member of the Interact, math and International Students clubs. She recently appeared in a montage of Edgar Allen Poe themes, where she had a speaking role and several choreographed parts, in addition to assisting with the scenery. Minja also loves to help people. She makes friends easily and is comfortable speaking with all types of individuals. She has already completed 25 community service hours and is working toward a goal of completing 100 hours. In addition, she mentors her host brother in Spanish and math. She has also taken an interest in American Sign Language (ASL) and is assisting her host mother, who teaches ASL. She commented that teaching others helps her in her own English skills. Minja embodies the principles of the A-SMYLE program and is a spirited student ambassador.